"Rush to the Rockies Celebration"
Born the youngest of six children, Fred Wills grew up on a small farm east of Colorado Springs, tending livestock and working the land with his family. After the death of his father, he and his family continued to work the farm for several hard years. When his older brother left the farm to join the Navy, Fred wanted nothing but to follow him into military service, but when he reached 18 years old, a heart murmer dashed those hopes by keeping him from passing the physical. At age 21, in late 1946, Fred moved to Colorado Springs, settling in with one of his older sisters. "I left the farm that winter and moved in with my sister and her family. My Uncle Otis worked at V.B. They needed help in the casting room. I put in my application and got the job. I took it to have something to do while I waited for a differant job to come up, but I fell in love with the potters wheel. It looked like magic to me the first time I saw it." 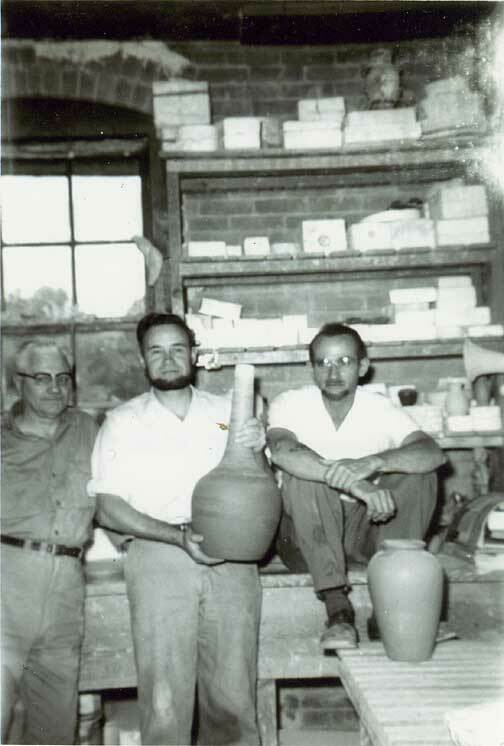 After coming to work at Van Briggle Fred met a potter named Clem Hull who became his friend and mentor. Clem taught Fred to become a potter and a lifelong friendship developed. "I went to work at V.B. around the first of march (1947). Clem had been there a while. We hit it off from the start. We became good friends right away, and best friends soon. I came straight from the farm, and Clem was well established in the pottery business. Clem and I bowled, fished, and deer hunted together. He had a plymouth station wagon at ane time and he bought a 1956 olds from me. We also played some softball. We had a V.B. team for one year. We were not very good but we had fun." Both men were soft spoken although Fred was a bit shyer than Clem. Clem would recite a little story about the first potter as he shaped the clay on the potters wheel while tourists watched. The owner of the pottery at that time was Jesse H. Lewis. Mr. Lewis encouraged Fred to recite the story as well. "I was too shy," remarks Fred. "I just couldn't do it." Living not too far from where he lives now, Fred became friends with a neighbor boy whose sister was attending high school in Denver. When she came home for the summer, Fred was dazzled by her sweetness and beauty. Betty responded to Fred's attentions and didn't return to Denver. The two were married in December 1947, Betty at the tender age of seventeen and Fred an old man of twenty-two. They are to this day a beautiful and loving couple. 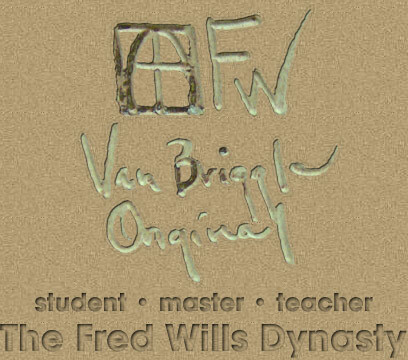 Fred continued to work at Van Briggle as he would do until the time of his retirement. His skills improved and he became one of Van Briggle's leading potters of the time. Fred reminisces about those years. "We did just about every job in the pottery. We cleaned out the sump, we set up and ran the filter press, loaded the blunger and loaded the kilns if we had to. I worked out in the plant more than Clem. 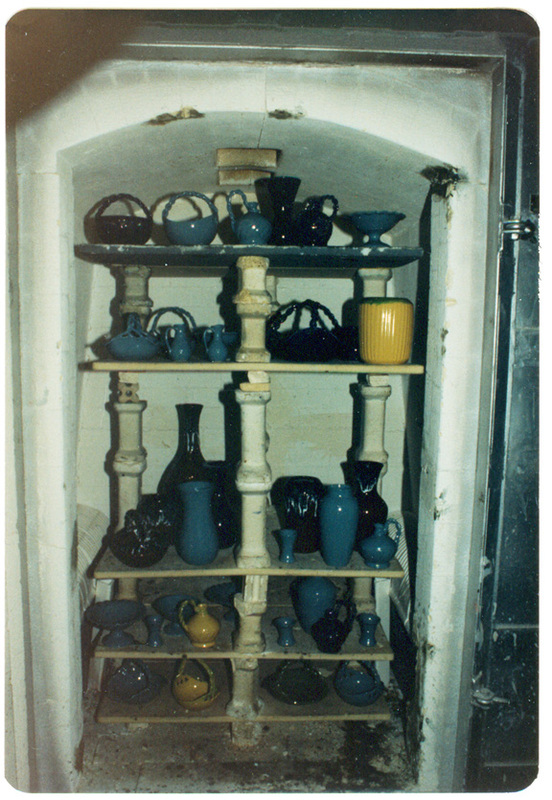 I worked in the packing room, rebuilt the kilns about every two years, dipped pottery for the spraying room and even sprayed in the summer time. When one of the old timers retired I took over supervising the color room and the kilns. I mixed all the glazes also. Had to make sure all the orders got done on time. We even made our own kiln shelves.That was good winters job. I don't know when I had time to throw the first ten years or so but I did. Clem helped rebuild the kilns also, it took about three men to get it done, and about six weeks to do it." During this time Fred and Clem decided they should teach Fred's uncle Otis to throw on the potters wheel. Later Otis would also join Fred and Clem in demonstrating the art for tourists. The friendship with Clem never waivered. When Fred bought a house on Willamette Place and decided he needed to expand it, Clem and Fred's other friends joined in digging the foundation for the expansion. Otis was there also. During the fifties, Van Briggle acquired the The Dryden Pottery and with it some clay batches and glazes. The Dryden glazes didn't work with the white clay used at the time by Van Briggle and the VB glazes didn't work with the Dryden clay formula. Mr Lewis decided to name the pieces using the Dryden clay and glazes the "Anna" line. Those pieces still said Van Briggle but said "anna" in place of the conjoined AA logo of the regular VB line. The "anna" pieces were made between 1955 and 1968. "I didn't do much to the glaze," Fred recalls, "except to adjust it some once in a while if some chemical changed on us. We made two different clay bodies for about a year after we moved (to the 21st Street plant). One was the Dryden clay body and one was the VB clay body. Joe Jezek and I worked out a clay body that would fit both glazes. That is when we dropped the "Anna Van" line." Fred also notes that among all the glazes he's worked with, the early Van Briggle glazes are his favorites. At one point during the late fifties, Clem broke his hand and it was in a cast. Mr Lewis told Clem he could continue to work as long as he was able to contribute. Fred did a lot of the throwing on the wheel making cups and saucers that Clem would make ears (handles) for. According to Fred, they must have made over 300 sets of cups and saucers that were signed both by Fred and Clem. 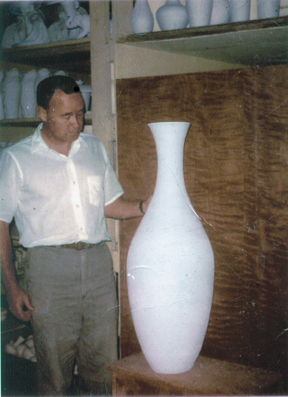 After his friend's death in 1965, Fred was the premier potter at Van Briggle. During their teen years, Fred's sons Fred W. and Don also put in time learning to throw on the wheel and demonstrating for tourists. The pieces they made can be identified by their initials on the bottoms of the pots. FWW for Fred W. and DW for Don. Fred trained a number of people to throw on the wheel. "We taught a lot of young people to throw good enough to demonstrate. Sometimes two or three every summer. Almost ever young man we hired for the summer wanted to throw." As his proficiency grew, Fred would experiment with new designs, always looking to please the ladies in the sales department so that his pieces would have good visibility. Fred also made some of the largest pots to be thrown on the potters wheel. "When I made the big vases I rigged up a heat lamp to dry out the inside and used a fan outside." he says. "The first one I made cracked in the final firing. It was on display for a while. The second one came out O.K., it sold for $100. I guess that was a lot of money in the sixties," he adds. "The third one was on display at the 21st street pottery and some kid crawled up on it and tipped it over and broke it. It took all day to throw one of them. Had to throw awhile then dry awhile. The taller and thinner they get the more they are apt to collapse, (but) The most effort in throwing a large peice is centering that much clay." In a career that spanned more than four decades he must be considered the most prolific potter in the history of the Van Briggle. Fred created more pieces than he could possibly keep track of for the company during his tenure there. His pottery is easily recognized by it's beauty, simplicity and grace. Although "officially" retired, if the mood strikes him Fred can still be seen throwing a pot or renewing acquaintances at Van Briggle. No part may be republished without permission. Elizabeth Shonk is the second daughter of Clem Hull. She is a pottery collector and artist living in Colorado.